You can Tribute Summon this card by Tributing 1 Tribute Summoned monster. If this card is Tribute Summoned: You can send 2 "Monarch" Spell/Trap Cards with different names from your hand and/or Deck to.. If this card is Normal or Special Summoned: During your Main Phase this turn, you can Tribute Summon 1 monster, in addition to your Normal Summon/Set. (You can only gain this effect once per turn.) Yo.. If this card is Normal or Special Summoned: You can Special Summon 1 monster with 800 ATK and 1000 DEF from your Deck in Defense Position, except "Edea the Heavenly Squire", also you cannot Special Su..
You can banish 1 Level 5 or higher monster from your Graveyard; Special Summon this card from your hand, also you cannot Special Summon monsters from the Extra Deck for the rest of this turn. If this .. If this card is in your hand: You can activate this effect; you cannot Special Summon monsters from the Extra Deck for the rest of this turn, also Special Summon this card, and if you do, Special Summ.. If this card is in your hand: You can target 1 face-up monster your opponent controls; you cannot Special Summon monsters from the Extra Deck for the rest of this turn, also Special Summon this card, ..
You can discard 1 card; Special Summon this card from your hand, also you cannot Special Summon monsters from the Extra Deck for the rest of this turn. If this card is Tributed for a Tribute Summon: Y..
You can return 1 Tribute Summoned monster you control to the hand; Special Summon this card from your hand, also you cannot Special Summon monsters from the Extra Deck for the rest of this turn. If th.. When you take Battle Damage: You can Special Summon this card from your hand. This card gains 600 ATK and DEF for each card in your hand. Once per turn: You can send 1 monster from your hand to the Gr.. If this card is sent to the Graveyard: Special Summon 2 "Fluff Tokens" (Plant-Type/WIND/Level 1/ATK 0/DEF 0) in Defense Position. These Tokens cannot be Tributed for a Tribute Summon during the turn t.. If this card is in your Graveyard: You can target 1 Level 5 or higher monster you control; reduce its Level by 1, and if you do, Special Summon this card. 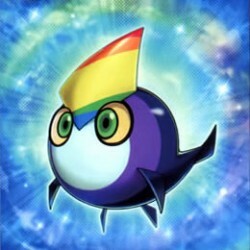 This face-up card on the field cannot be Trib..
You can only activate each effect of "Rainbow Kuriboh" once per turn. :- When an opponent's monster declares an attack: You can target that monster; equip this card from your hand to that target. It c.. Send 1 "Monarch" Spell/Trap Card from your hand to the Graveyard; draw 2 cards. You can banish this card from your Graveyard; reveal 3 "Monarch" Spell/Trap Cards from your Deck, your opponent chooses .. While you have no cards in your Extra Deck and you are the only player that controls a Tribute Summoned monster, your opponent cannot Special Summon monsters from the Extra Deck. If a Tribute Summoned..
You cannot Special Summon monsters from the Extra Deck. When you Tribute Summon a monster: You can activate 1 of these effects; :- Add, from your Deck to your hand, 1 monster with 2400 ATK and 1000 DE..
Once during this turn, if you would Tribute a monster(s) for a Tribute Summon, you can Tribute 1 monster your opponent controls as if you controlled it. You can only activate 1 "The Monarchs Stormfort..